The NO TAV had called for everyone to join them on a big demonstration in the Valley. Thousands of people – 75.000 or more – united once again in their refusal of the government’s terror tactics against the movement. Parts of the demonstration were heavily charged and activists injured. During the following days many public assemblies took place, and the movement’s official sites announced they were predicting an expansion of the buildings sites to happen very soon, and called for support. A baita – a mountain refuge – that had been occupied and used by the movement as a lookout post was evicted by hundreds of riot cops. The NO TAV activist Luca – who was on air with Radio Blackout to witness the eviction – was severely injured while he was trying to escape: he scrambled up an electricity pole, suffered an electric shock and fell to the ground. Despite this the eviction carried on, and Luca was finally transported to a nearby hospital only about an hour after the incident. The remaining activists were not allowed to leave till the afternoon. 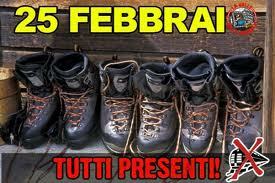 From 27th February to 1st March – Val Susa in every city! A call out was issued for 1st March to be a national “Block Everything Day” in solidarity with the struggle. Traffic blocks of major motorways and symbolic places (like political parties’ offices) took place all over Italy all day, with heavy police charges in some cases. Anonymous Italy, openly supportive of the NO TAV movement, showed their solidarity by shutting down the Italian Police and Carabinieri public sites. In the meantime the government issued an ultimatum, urging the movement to “stop the violence”. Another big day of national and international mobilisations, with solidarity initiatives taking place all over Italy and Europe: London, Paris, Dublin, Budapest, Lyon, Kiev, San Sebastian, Barcelona…and more. Anonymous Italy responded once again to the NO TAV appeal for a total block by targeting Turin City Council and Piedmont Region’s public sites. ALL OF THE TAV LINE = unemployment benefits for everyone! Far from being a NIMBY (“Not in my backyard”) movement – as I’ve seen remarked on occasions – the NO TAV struggle, as with the Occupy Movement or the Spanish indignados, has transcended from being a local community’s environmental battle to becoming a diverse but united movement of different groups of people fighting not only against the destruction of the local environment that the TAV line would bring, but also the devastating social and economic effects it would have (and already has had in part) on the communities affected by it, and the huge profit that the big companies involved would make out of it. The NO TAV – dare I say – is an anticapitalist movement. Yeah, it looks like the No TAV movement is getting really interesting.. there were blockades literally across the whole country: the Palermo-Catania motorway was blockaded for two hours, the same happened in Bologna, Rome etc. I also read that a train station was occupied in Livorno..
Another article I read (on Infoaut.. cheers to Italy Calling for the hookup ) was saying similar stuff to what IC was saying i.e. that No TAV has gone way beyond just the affected villages in Piemonte and has become Italy's Occupy (in Italian - if IC or someone wants to do a translation I think that would be great!).. I might wait a couple of days before translating though, there's still so much going on I find it hard to keep up with everything...! But I totally agree with InfoAut and Uninomade - the NO TAV is a great thing for Italy, I think I wrote this before on the forum. It certainly is the first movement or cause that I've seen in my life that's really managed to unite different groups of people (from radical social centre to priests, from environmental activists to unemployed people...) in one huge struggle against everything that is totally wrong and fucked up in Italy. It certainly is the first movement or cause that I've seen in my life that's really managed to unite different groups of people (from radical social centre to priests, from environmental activists to unemployed people...) in one huge struggle against everything that is totally wrong and fucked up in Italy. I think there are parallels with the Aysén protests which are starting to have a similar effect in Chile. Maybe these kinds of protests are showing a potential way forward for indignados/occupy type movements generally. Hi Mark, I realise now it might not be that obvious but I meant it's the first movement I see like this in Italy, in my lifetime. I didn't mean to say the world has never seen something like it - hope it didn't sound like that! I don't know much about Chile - will check that out. For me the great, new thing about the NO TAV is that I've never seen something so united and compact in Italy before. The media and the government are doing their best (or worst, depends on the point of view) to divide them, but they couldn't care less. IC - Looking at my comment again it sounds like I was picking up on what you wrote and making a criticism, which wasn't intended at all. It's just that it struck me that the Aysén protests (which developed in part out of earlier opposition to the massive Hidroaysen dam building scheme) and No TAV might both be doing something that goes beyond the somewhat vague politics and demands of the indignados and occupy movements. Then again I might be making too much of this. Yep, I agree with you. I really believe and hope we're not just making too much out of these protests.